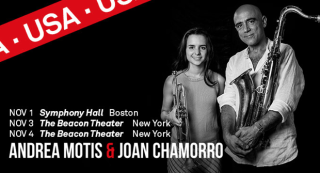 Singer and multi-instrumentalist Andrea Motis,along with her menthor Joan Chamorro, and Catalan guitarrist Josep Traver will be performing in the Unitet States of America. The trio will be in charge of oppening the Orquesta Buena Vista Social Club® shows in Boston & Nueva York. Very special dates of Buena Vista's farwell tour. Nov 2nd at the Symphony Hall in Boston, and 3 & 4th at the Beacon Theater in Nueva York.